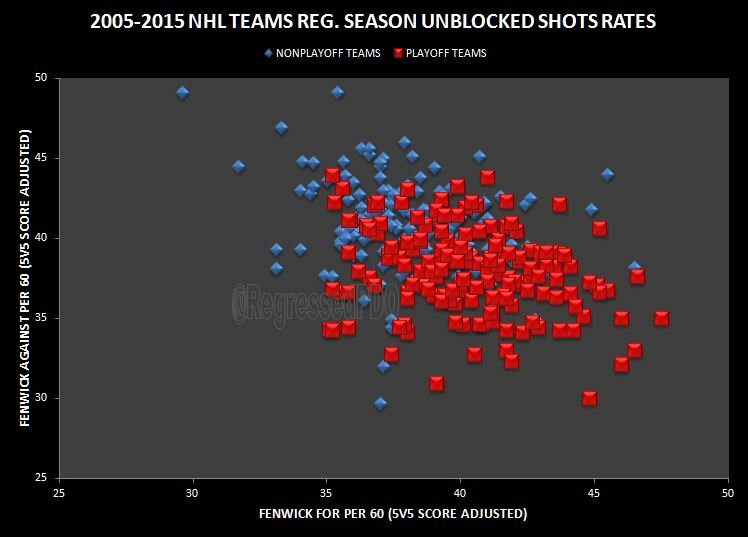 Below are the regular season unblocked shots rates for every playoff team from the 2005-06 season through the present season presented in the form of their deviation from the league average for each metric that season. Teams above the horizontal axis gave up shots at a higher rate than league average whereas teams below it gave up shots at a lower rate. Teams to the left of the vertical axis took shots at a lower rate than league average and teams to the right took shots at a higher rate. It makes logical sense that being in the bottom right quadrant (give up less shots, take more shots) is the best place to be. 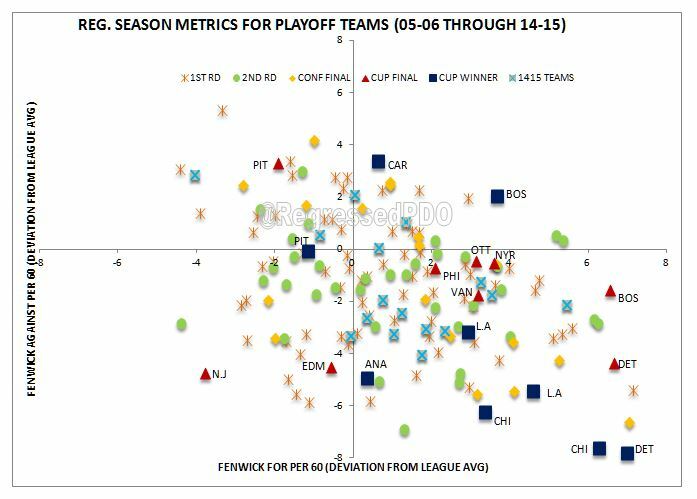 It really should not surprise anyone to find the majority of the Stanley Cup winners and finalists in the lower right quadrant. 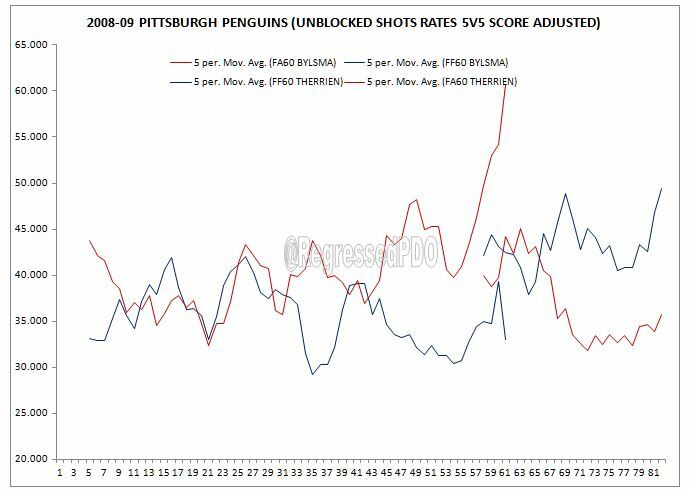 The 2008-09 Pittsburgh Penguins team is the only Cup winner on the left side of the vertical axis, but when we look closer, we see they were much better going into the playoffs than their season-long metrics suggest. After the firing of Michel Therrien and subsequent promotion of Dan Bylsma, the Penguins turned their season around and ended up winning the Cup. The 2005-06 Carolina Hurricanes and 2010-11 Boston Bruins are the other Cup winners above the horizontal axis and anyone who remembers those series will tell you the goalies absolutely deserved to win the Conn Smythe Trophy. Then 21 year old Cam Ward came in to save the Hurricanes’ bacon posting .940 (Round 1), .917 (Round 2), .901 (Conference Final) and .920 (Stanley Cup Final) Save Percentages (all situations). 36 year old Tim Thomas’s performance for the Boston Bruins in the 2010-11 playoffs was nothing short of masterful. In all situations, Thomas posted .926 (Round 1), .953 (Round 2), .916 (Conference Final), and .967 (Stanley Cup Final) Sv%. 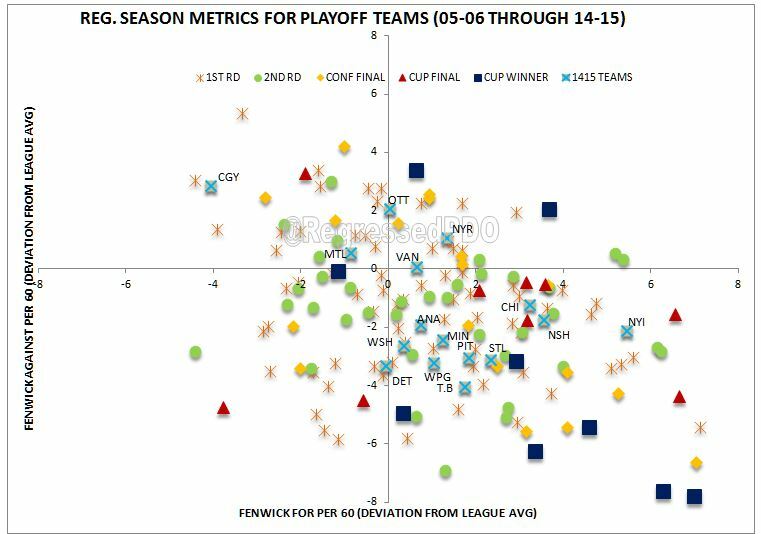 Where do this season’s playoff teams stack up at 5v5 play with the playoff teams of the past? At this point, it is fair to say that there isn’t one specifically dominant team to point to as a favorite. The Calgary Flames are the oddball this season as the Colorado Avalanche were last season. Many of the matchups in Round 1 of the playoffs are very difficult to predict. 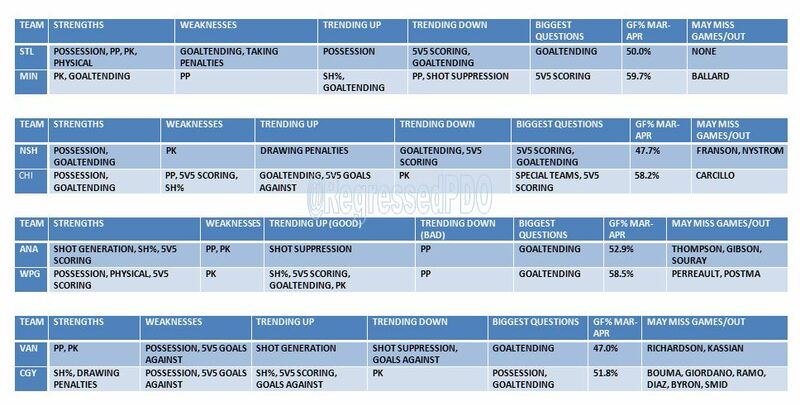 Below is a breakdown of some interesting metrics, each team’s strengths and weaknesses as well as some notes on which teams seem to be getting hot or going cold in certain areas of play. 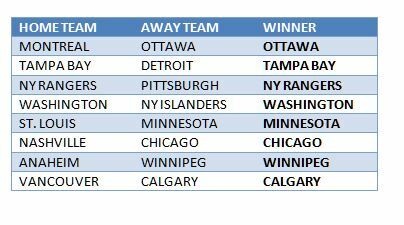 All of these matchups are pretty tough to call and as we all know, anything can and will happen in the playoffs, but I’ll take a shot at guessing the winners anyway. ← What’s Wrong With Patrick Sharp? Hey Jen! You rock!!! I heard you with Laurence Holmes last night and was really glad he had you on. I’ve enjoyed the couple of articles I’ve read in your blog and I really enjoyed getting an intro to your work last night. I look forward to upcoming articles and hope you’re on the radio again soon! This is really cool and I’m glad I stumbled upon it. What was your determining factor for picking the 1st round? 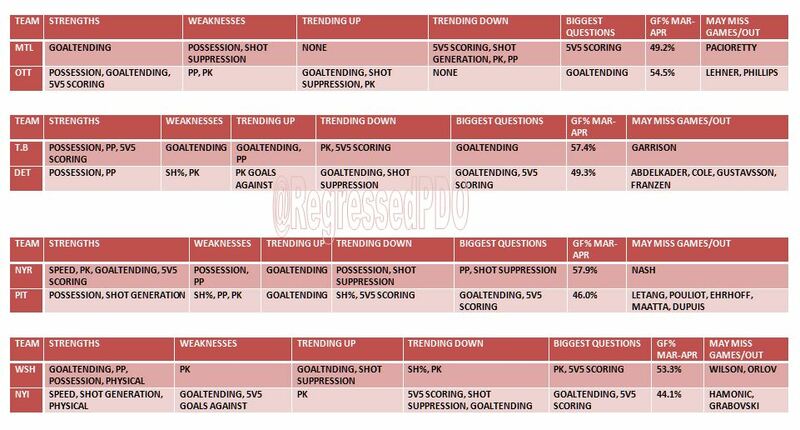 Looks like GF% mar-apr line up well. In hindsight those picks look pretty good. Keep up the good work!